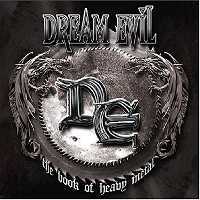 Dream Evil's The Book Of Heavy Metal ranks as the guiltiest pleasure of the year. Musically flawless and lyrically hilarious, The Book Of Heavy Metal sets the often-jaded genre of power metal on its ear, demonstrating that the musical approach remains viable if executed properly. Originally an epic metal band (following the likes of HammerFall and Rhapsody), as demonstrated by its debut Dragonslayer, Dream Evil with The Book Of Heavy Metal shifts more toward straightforward power metal mixed with elements lifted from the new wave of British heavy metal. Anchoring the band is drummer Snowy Shaw (Mercyful Fate, Memento Mori, and Notre Dame), whose percussive bursts have never sounded better. Bassist Peter Stalfors throbs out the low notes, giving the band a solid low end. Out front is a pair of guitars. One of the six-string axes is handled by producer extraordinaire Fredrik Nordstrom (bands he's worked with include Dimmu Borgir, HammerFall, In Flames, and The Haunted), whereas the other is wielded by wizard Gus G. (Firewind, Mystic Prophecy, and Nightrage), who has since left the band. Tackling vocals is Niklas Isfeldt (Throne Of Chaos), whose powerful voice rarely ventures into the over-the-top antics of so many power metal bands. Over the top, however, best describes the lyrics found on The Book Of Heavy Metal. Of the 12 compositions, half pay homage to heavy metal and rock music in general. Some of the songs are simply hilarious, with lyrical flourishes such as "The only thing I want is what my parents don't" from the title track, to "Some wimps they prefer staying neutral" from M.O.M. (Man Or Mouse). Not all is lost, for the band shows that it can write effectively with tracks such as the rousing Into The Moonlight, the effective and moving Crusaders' Anthem, and the introspective Tired. The Book Of Heavy Metal comes enhanced with a video of the band's title track, which features Snowy Shaw looking like something out of the movie The Road Warrior. Some CDs also feature a bonus DVD, which includes concert footage and the production process behind the album. Many critics have taken potshots at this release, and some of these criticisms have been deserved. Still, the music created on The Book Of Heavy Metal surpasses much of the crap out there, and there's no denying that the band can kick out the jams. So, pick up the sledge of rock and start swinging!